Your mouth is a weird place. It’s one of the few areas of the body that voluntarily opens, allowing access to the inside of the body. It’s often filled with bacteria, and so many things that happen inside of it can be off-putting. Your gums may develop a white tinge to them. Your tonsils can develop “stones.” You may even get lumps on your gums. Hard lumps. But what are these lumps? Should you be worried if they begin to appear? In this article, we’ll cover lump on gums issues. From a lump or cyst on gum problem, to a white bump on gums problem, we’ll help you identify the different types of bumps and inform you of lump on gums treatments, both medical and natural. By the end of this article, you should be well armed (with knowledge) should any lump appear above your teeth. The unfortunate thing about mouth issues is that there can be multiple reasons behind them. What causes a lump on gums in your mouth may not cause a lump on gums in your friend’s, and vice versa. But there are a few causes that are fairly common. A cause of many dental anomalies is irritation. A lump may form as your gums try to defend themselves from whatever the irritant is. Exactly what is irritating the gums can be a multitude of things. 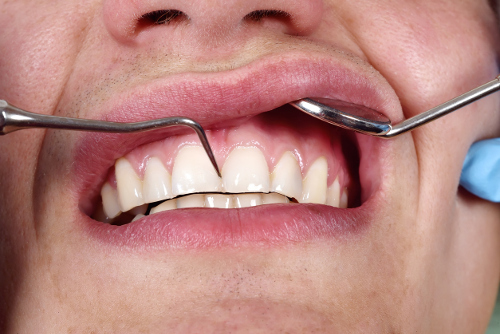 Trapped food, bacteria, or injuries to the gum or tooth could all be sources of irritation for your gums. Small ulcers that are quite common, canker sores can also be caused by any number of things. Spicy foods. Infection. Gum irritation. Canker sores can be white and painful, pink or red, and often form a lump on your gums. Gingivitis is a gum disease that usually begins after a prolonged period of irritation and infection. As a side effect of gum disease, the inflamed gums may form small lumps. After a tooth extraction, it’s not unusual to see a lump form near the site of the procedure. This is usually just a defense mechanism due to gum irritation, or possibly a small blood clot caused by the extraction. Most of these causes aren’t too unusual, and can be dealt with easily. However, it should be noted that not all of the bumps you get on your gums are the same. In fact, white bumps can be a pretty harsh lump to occur. There are some white bumps on the gums that are a little more than just gum irritation. These bumps are called parulis or gumboil. These white bumps usually form from nerve tissue around a dying or dead tooth, which causes white blood cells to flood into the area to help repair it. The area tends to fill with pus while battling this infection and appears on the gums as a white bump. The white bump on gums may cause no pain, but you should see a doctor or dentist to take care of the bump before it causes further issues. The process of diagnosing the lump on your gums is very similar to any other medical diagnosis. The doctor will ask you about your recent medical history, especially where it concerns the lump. When did you first notice the lump? Have you noticed a color change? Is there a family history of oral cancer? This will be followed by a physical examination to try and determine what may have caused the lump. X-rays and CT scans may also be used to define the issue. Finally, if it looks serious or the doctor is unsure what the lump is, a biopsy may be performed for further clarification. Once the cause of the lump is figured out, you can move on to treatment. Root canal: If it’s a dying or damaged tooth causing the bump, you may need a root canal, which replaces the infected material inside the tooth. After the root canal, the bump should fade away. Medication: Antibiotics, in particular, may be used to clear up any infection and inflammation that might be causing the lump on your gums. Extraction: In the event that a root canal doesn’t help, your tooth may need to be extracted. After extraction, there will be a period of healing that may cause another bump, but it will eventually heal along with any of the original lumps on your gums. These treatments might seem a little harsh, but if you’re lucky, you won’t have to go through any of them. Some bumps can be treated naturally. Used for many mouth issues, a saltwater rinse may help reduce any pain you may have as well as clean out some of the bacteria that could be causing the bump. Mix one teaspoon of salt with one cup of water. Swish and gargle with the saltwater rinse for a few minutes every day for a week or two. Applying clove oil directly to the bump could also help clean out the bacteria and infection. For lumps on gums, the easiest, most thorough way to use clove oil is to pour some on your toothbrush and brush your gums and teeth with the oil. Applying raw garlic to the lump may help clean out the bacteria causing the lump. Take a tablespoon of oil, and swish it around your mouth for a few minutes. This should grab the bacteria causing the infection, and when you spit it out, the bacteria leaves with the oil. For the large part, lumps on the gums aren’t really anything to worry about. But, that’s not to say they shouldn’t be treated. For minor issues, try using one of the natural treatments that we’ve listed above to clean the lump out. But there are some serious issues that may come with a lump on the gum. Either way, there is no harm in getting it checked out by a doctor. “Lump on Gums,” MD Health; http://www.md-health.com/Lump-on-Gums.html, last accessed April 27, 2017. “Lump on Gum, Hard, Painful, Bump, above Tooth, upper, Near, Cyst, Causes, Cyst, White,” Heal Treat Cure; http://www.healtreatcure.org/gums/lump-on-gum-hard-bump-above-tooth-cyst-causes-white-get-rid/, last accessed April 27, 2017. “Lump on Gums,” MDDK; http://mddk.com/lump-on-gums.html, last accessed April 27, 2017. Erin, “How to Get Rid of an Abscess in Your Mouth,” Enki Village; https://www.enkivillage.org/how-to-get-rid-of-an-abscess-in-your-mouth.html, last accessed April 27, 2017. “White Bumps on Gum, Causes, Hard Lump, Near Tooth, Small, Hurts, No Pain, Pictures & Treatment,” Health Edition, http://www.healthedition.org/bumps/white-bumps-on-gum/white-bumps-on-gums-causes-hard-near-tooth-symptoms-painful-treatment/, last accessed April 27, 2017.